Joplin is becoming a city of murals and two new works at Missouri Southern have been added to the list. The indoor murals were unveiled on March 13 in Spiva Library. The murals, located in the northwest corner of the third floor and in the northeast stairwell between the third and fourth floors, were completed by Missouri Southern art students, under the direction of Kyle McKenzie, assistant professor of art, and Frank Pishkur, chair of the Art Department. Kyle McKenzie talks about the three-panel mural added to the northeast stairwell of Spiva Library. “The art students who worked on the murals should be acknowledged and celebrated, as they developed the murals and spent countless hours working on them,” Pishkur said. Those contributing to the project included Zainab Almuhanna, Luke Blevins, Rachel Folkert, Cheyenne Fox, Taylor Green, Lydia Humphreys, Morgan Leeper, Gayle O’Neal, Makenzie Paden, Veronica Pickett, Sydney Pierce, Donna Pooley, Carla Rea, Tyler Shoup and Shay Thomas. “My coworkers and I are very pleased to have the murals in Spiva Library,” said James Capeci, interim director of library services. “We are proud of the art students who painted them and marvel at their artistic expression and abilities. We are also thankful for the art department’s collaborative spirit. 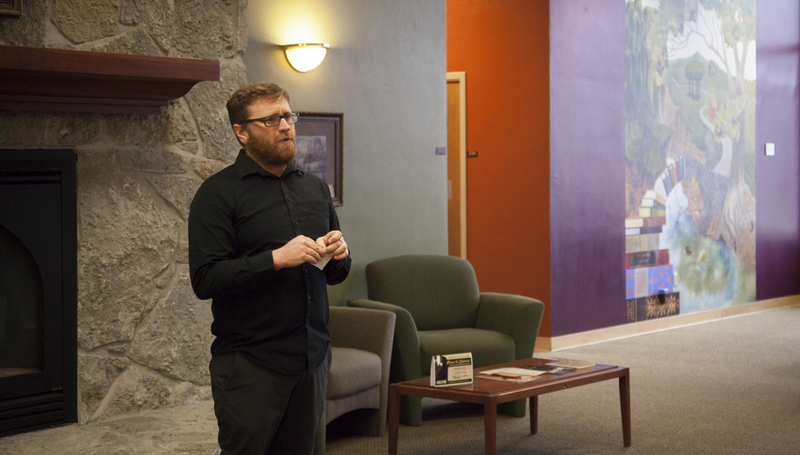 Frank and Kyle approached the library last summer about pursing this collaboration and the best part of their pitch was MSSU art students would paint the murals with their encouragement and guidance. The final products are beautiful and will last for years.